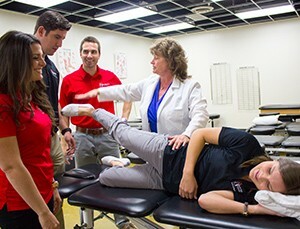 The Doctor of Physical Therapy (DPT) is a professional and not a research degree. Students in the program will be involved in evidence-based practice/translational research projects as part of coursework and clinical internship. Students are expected to complete the program in three years while attending full-time as there is no part-time program. The minimum number of units for the DPT program of study is 121 units and the maximum number of units allowed is 121 units. For a general overview of our curriculum, see the DPT Curriculum Systems Continuum (pdf).